A couple of the tête-à-tête mini daffodils flowered in the garden yesterday (21 Feb 2015) – they look lovely and are definitely a sign that spring is on the way. We’ve also got a fair few in a couple of pots which should flower soon. I know we planted a lot of these bulbs around the garden last autumn as I’d never had mini daffs before and I liked the look of them. Not many are showing signs of growing let alone flowering – they might have rotted or the squirrels got them will have to wait and see – oh well. As I said in my previous post, Spring makes me think of change and new or different things to do. One thing I decided to do this year was some sewing projects. 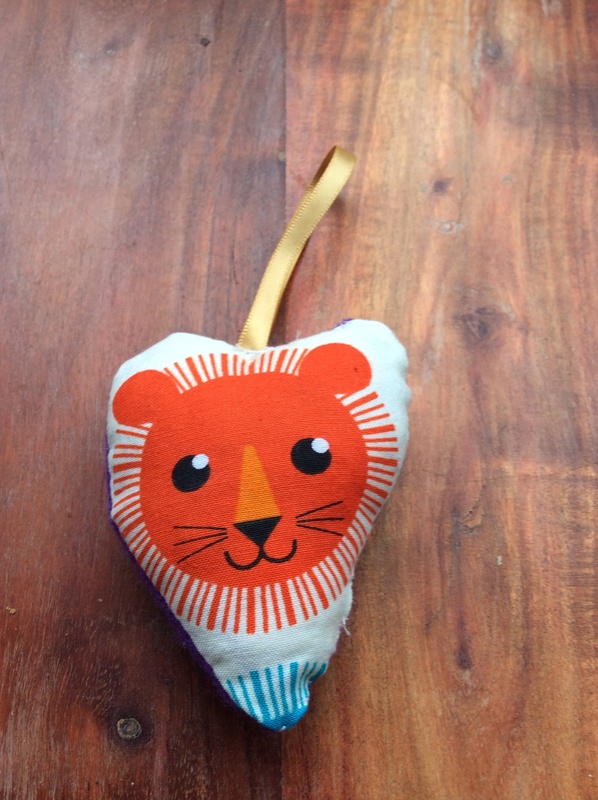 I can sew; I did plenty as a child and teenager, it was just one of those things you learnt to do in the 1970s. My mum made clothes and knitted jumpers for us. She taught me to do a lot of different crafts. I wasn’t any good with a sewing machine – I remember the look of disappointment on my teacher’s face in 1st year of senior school when I made a right mess of a simple blouse pattern. I can knit and crochet too but not done any for over 35 years and I can’t see me starting again. But, I’ve not done anything except buttons and hems in over 20years. I decided to have a go at small projects so I didn’t have stuff hanging around making me feel guilty that I’d not finished it. I’m pretty sure the last major project was a cross stitch lighthouse picture – in 1989ish. It’s probably lurking somewhere at my mum’s house. 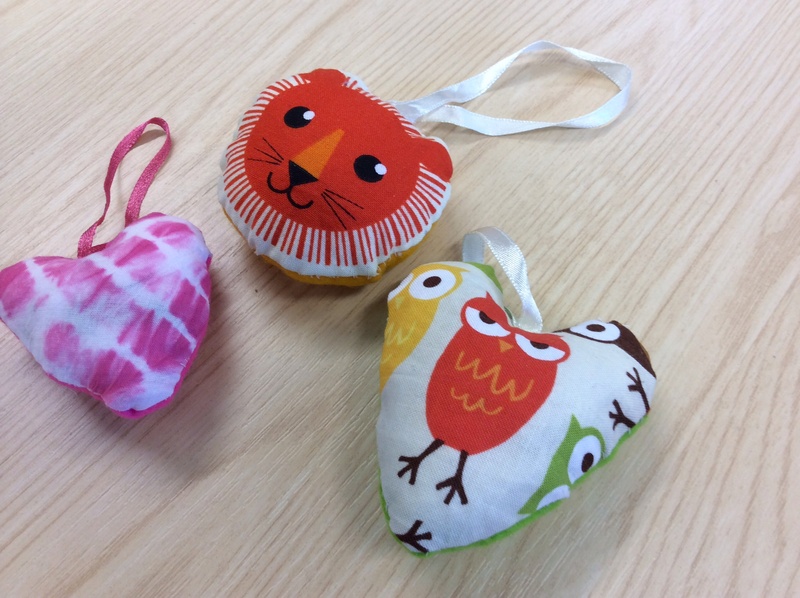 A pal at work was making lavender ‘bags’ sell for Red Nose Day so I asked if I could make one or two. Here’s some my pal has made – aren’t they great. Lovely material too. Cotton material – anything you like really or one side could be felt. Cut two pieces of material pin inside out and hem carefully 5mm in from edge. Start sewing from left side. Double over a piece of ribbon so that loop is inside the material and ends sticking out. This is because it’s turned inside out before you stuff it. Sew all the way round leaving a 3cm gap. Turn inside out with pencil. Then stuff with kapok – make sure you fill in all the edges and it feels solid. Spoon in a couple of tablespoons of lavender. Manipulate it a bit to make sure it’s not lumpy. Carefully sew up the gap you’ve just pushed kapok and lavender through and you’re done. This took about 45mins to make – though there were lots of us chattering away. I’ve always loved lavender – the plant and its scent – it’s supposed to be old fashioned but I prefer to think of it as timeless. The scent also helps you sleep too; I have a lavender oil spray as I have a problem with insomnia. Traditionally, it symbolises devotion and was often included in bridal bouquets especially in the 19th century. There are lots of different kinds of lavender but you usually find French and English Lavender in garden centres. French has fat looking flowers and English tends to have thinner flowers. Two summers ago, I planted English lavender along the edge of my front garden which gets full sun all day. The plants have thrived and it’s surprising how much scent comes off the silver/grey foliage throughout the year. It flowers from June/July through to late August depending on how sunny it’s been. I love coming home and smelling the scent and seeing the flowers – purple is my favourite colour after all. I’ll take some photos this summer I promise. I think I’ll also write more about lavender another time too – lavender biscuits anyone? I really must have a go at drying lavender this year – it looks easy. lavender likes full sun and doesn’t mind drought / lack of water. bees absolutely love the flowers -so please do your bit for the bees and plant some. it loves gritty, poor quality soil but it needs to be free draining – so no compost. it will grow in pots but be careful where you put it especially in the winter. It’s hardy but I’ve had plants in pots die over the winter when it’s been below freezing for a few weeks. trim scraggy looking parts in the autumn after it’s flowered. If you want more information – have a look on Royal Horticultural Society website – lavender – they’re the experts. This entry was posted in Crafting, Gardening, Sewing and tagged change, decorations, lavender, spring on February 21, 2015 by Bec - views from my garden bench. When I was younger I thought Autumn was my favourite time of year – it’s when my birthday is after all. I like watching the leaves change, kicking my way through piles of leaves on country walks and relaxing next to a real fire. I love crisp autumn and winter blue skies as long as I’m wrapped up well – I hate being cold. But over the years, I’ve got thoroughly fed up with months of rain, overcast skies and dark evenings. I’ve never been diagnosed with SAD syndrome but I do think I have tendencies towards this. I find the Autumn and Winter make me glum a lot of the time – though I have all strategies to try not to sink further into gloom. They don’t always work – for a start I miss sitting in my garden in the winter – and that doesn’t help much either. Maybe this year we’ll get a fire pit. So I’m definitely with Virginia – I love Spring. It’s all about new beginnings, opportunities and change. I don’t do New Year resolutions either; I make all my changes on in mid-February usually – I do it on my terms and just get on with it. I don’t beat myself up about what I don’t change or keep having a go at and not quite succeeding at (getting into smaller jeans, for example). I do believe that if something didn’t work out today have another go at it tomorrow. But, it’s also just as important that I need to do things differently or look at the problem differently and try to find a new way to do something. As I make changes at a different time of year there’s no pressure from ‘new year new you’ articles and no smug celebrities flogging books, new wonder drinks or food. And as for ‘detox’ with this or that juice? Don’t even get me started on this – it’s tosh. There are quite a few things I’d like to change or try this year and this is one of the reasons I decided to write a blog. The snowdrops are out – though I can’t get them to grow in my garden. 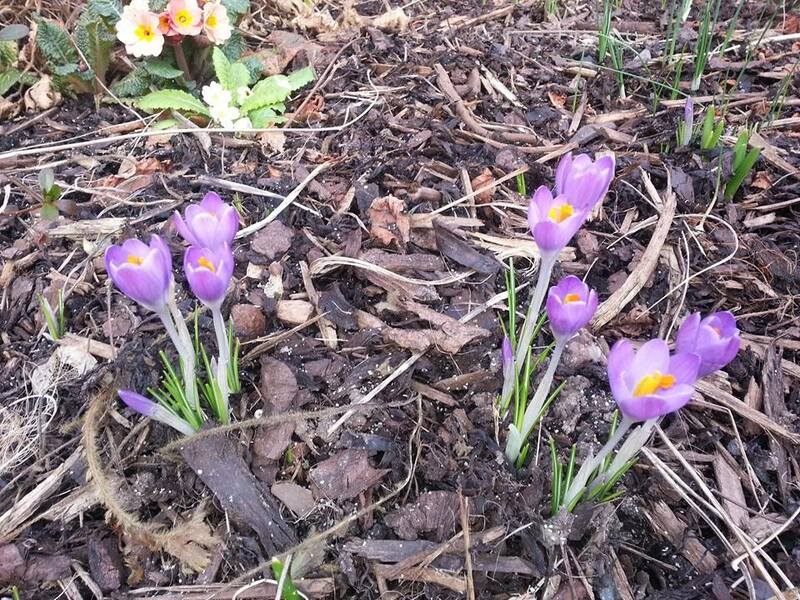 So spring is definitely on its way – here’s the crocuses came up in our front garden – it has really brighten my mood. We’ve even booked a holiday – to Cornwall in May. Usually I buy my bulbs from Wilko – there’s a great selection at a good price. Plant them in little clumps not in rows and check the depth! Have fun! And if you don’t like where they are you can always move them for next year. What would you like to change from tomorrow? and what are your favourite bulbs and why? This entry was posted in Gardening and tagged bulbs, change, Health and Wellbeing, New year, spring, Virginia Woolf on February 17, 2015 by Bec - views from my garden bench.